Quantum Hex-Logic Buffing Pads manipulate physics to deliver better polishing results. White Light-Medium Quantum Polishing Pads restore gloss, reflection, and a deep-wet shine after removing heavier swirls and scratches with harder cutting pads. Quantum Hex-Logic Buffing Pads manipulate physics to deliver better polishing results. White Light-Medium Quantum Polishing Pads restore gloss, reflection, and a deep-wet shine after removing heavier swirls and scratches with harder cutting pads. The White Quantum Pad is the perfect pad for finishing polishes like V38 Final Polish or light swirl removers like V36 Cutting Polish. The new Quantum design represents a great leap forward in polishing pad technology. Innovative new foam polishing pads smoothly transfer power from the polishing machine into paint while minimizing heat, wear and tear, and user fatigue. High endurance Quantum pads are designed for dual action polishers, long-throw orbital machines, and high speed rotary buffers. Quantum Hex-Logic Pads combine new pad geometry with tried-and-true Hex-Logic grooves to ensure maximum coverage, enhanced cooling, and fast and efficient work. R&D fitted the new Quantum pads with a more durable and breathable hook and loop interface plate for a stronger bond that conducts heat away from the machine and pad. The precision-cut Race Face creates a gradual tapered profile to spread out compression from the user’s hands and reduce wear and tear on the foam pad. Improved manufacturing techniques, adhesives, and materials ensure that Quantum Hex-Logic Pads last longer for better polishing results job after job. By understanding the physics of polishing, Quantum Hex-Logic engineers extended the lifespan and efficiency of Quantum polishing pads by adding a Precision Port vent hole. Venting the pad where it spins the fastest reduces torque stresses on the material and channels heat away from the hottest part of the pad. Quantum Polishing Pads come in the full Hex-Logic color spectrum, so there’s a Quantum Pad for every compounding, polishing, and finishing job on any vehicle. 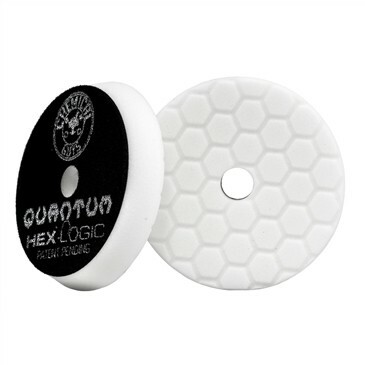 Pick up the new Quantum Hex-Logic buffing and polishing pads for a polishing experience that changes everything.